The thyroid hormones, thyroxine (T4) and triiodothyronine (T3), are tyrosine-based hormones produced by the thyroid gland and are primarily responsible for regulation of the metabolism. 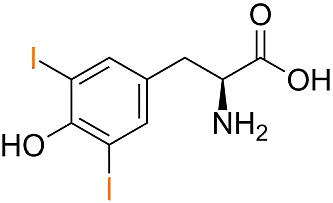 Thyroxine (sum formula C15H11I4NO4) is the prohormone to triiodothyronine, in short T3 (the only difference to T4: three iodine atoms in the molecule). In humans, the ratio of T4 to T3 released in the blood is roughly 20 to 1. Thyroxine is converted, within the cells (liver, kidney, muscels) to the active T3 (three to four times more potent than T4). Thus, T3 is the "true" hormone, whereas T4 is used to get it into the target cells, where it is converted to T3. T4 has a half-life of 7 days, T3 of approx. 1 day. 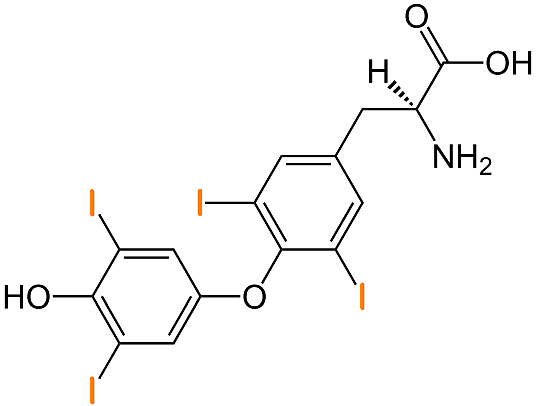 Levothyroxine (also known as L-thyroxine) is the Generic Name (DCI, INN) for thyroxine (T4), and is produced synthetically (first accomplished in 1927 by the British chemists Charles Robert Harington and George Barger) but is chemically identical to T4. It is typically used to treat hypothyroidism (underactive thyroid gland). In pills, it is found as levothyroxine sodium, a slightly brownish-yellow, fine, crystalline powder, which is not well soluble in water. Brand names: Eltroxin ®, Euthyrox ®, Levaxin ®, Levoxyl ®, Levothroid ®, Novothyral ® (combined with T3), Roxin ®, Synox ®, Synthroid ®, Thyrax ®, Thyronorm ®, Thyrox ®, Tirosint ®. Liothyronine is the Generic Name for the synthetic form of triiodothyronine (T3). 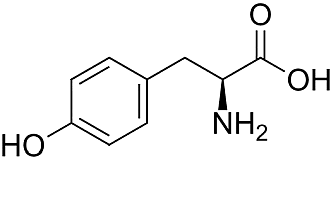 The basis is the amino acid tyrosine: via iodization first Monoiodotyrosine (MIT) is created, and further iodization leads to Diiodotyrosine (DIT). Two DITs are than combined to from T4 (or, to a much lesser extend, 1 MIT and 1 DIT to form T3), which is thus composed of 2 phenol rings (benzyl groups) and 4 iodine atoms. All steps take palce in the follicular lumen of the thyriod gland. The enzyme thyroid peroxidase (TPO), which requires hydrogen peroxide, is responsible for the iodization and possibly for the coupling of DIT and MIT (still under investigation). The question is: why is there any T3 produced and released into the blood? The answer might be: different tissues have different sensitivities to T4 due to differences in deiodinase ubiquitination. This in turn raises the question if T3 should be included in thyroid hormone replacement therapy (THRT). More than 99.4% of the thyroid hormones, circulating in the blood, are bound to transport proteins. Notably, by the thyroxine-binding globulin (TBG, 70 %), a further 10-15% by transthyretin ("thyroxine-binding pre-albumin" (TTR or TBPA)) and another 15-20% by serum albumin. Contrary to common belief, T3 and T4 do not cross the cell membrane easily, since the iodine is in o-position, which makes the phenolic OH-group more acidic, resulting in a negative charge at physiological pH. However, at least 10 different iodothyronine transporters (located in within the cell membrane) have been identified in humans, which guarantee that intracellular levels of thyroid hormones are higher than in blood plasma or interstitial fluids. However, the common transport and function is carried out via a well-studied set of receptors in the cells nucleus, the so called thyroid hormone receptors. T4 is converted to the active T3 within cells by deiodinases (5'-iodinase). These are further processed by decarboxylation and deiodination to produce iodothyronamine (T1a) and thyronamine (T0a). All three isoforms of the enzyme deiodinase contain selenium, thus dietary selenium is essential for T3 production. The hormones thyroid (T4) and triiodothyronine (T3) are very ancient compounds, which have already been found in evolutionary very old chordate. Malfunctions by Quantity: both excess and deficiency of thyroxine cause disorders. Hyperthyroidism (an example is Graves Disease) is the clinical syndrome caused by an excess of thyroxine, triiodothyronine, or both. It is a common disorder that affects approximately 2% of women and 0.2% of men. Hypothyroidism (an example is Hashimoto's thyroiditis) is the case where there is a deficiency of thyroxine, triiodiothyronine, or both. It is a common disorder that affects approximately 3% of women and 0.3% of men. Goitre (also goiter): An enlargement of the thyroid gland independently of the metabolic status (over-, under-, or normal or normal function). The most common cause for the emergence of a goiter is an iodine deficiency (over 90% of the cases). Thyroiditis: The medical term for an inflammation of the thyroid gland. The term comprises several diseases of different causes, which differ greatly in their clinical course and the prognosis. Thyroid cancer: a malignant neoplasm (= abnormal growth (of tissue)) originating from the follicular thyroid cells. The thyroid cancer is divided into different types, the most common often occurring in the young adult age. A generic drug (pl. generic drugs, short: generics) is a medication which is produced and distributed without a brand name. A generic must contain the same active ingredients as the original formulation. In most cases, it is considered bioequivalent with respect to pharmacokinetic and pharmacodynamic properties. By extension, therefore, generics are assumed to be identical in dose, strength, route of administration, safety, efficacy, and intended use. However, the generic pills differ in some aspects from the brands. The physical composition and optical appearance of medications as well as brand names are the intellectual property of the brand manufacturer. Usually these excipients do not (should not) have any effect on the active pharmaceutical ingredient (API). However, there were a few cases reported, were the generic drug was less potent, because of less suitable additives. costs associated with the research and development of the drug by reverse-engineering the formula of existing brand name drugs to allow them to manufacture bioequivalent versions. costs associated obtaining regulatory approval. Thus they do not bear the burden of proving the safety and efficacy of the drugs through expensive clinical trials. only to some extend: marketing costs and distribution costs. The brands have been on the market for usually a decade or more and do not need additional advertising. For the same reason, generic manufacturers also do only rarely give away sample doses to physicians to promote their products. The significant research, development and marketing costs incurred by the large pharmaceutical companies in introducing a new drug to the market is often cited as the reason for the higher cost of new agents - they wish (understandably) to recover these costs before the patent expires. Catabolism: provides energy through the degradation of complex organic matter (ultimately derived from food intake). Anabolism: consumes energy by the building up of components, such as proteins and nucleic acids. The thyroid gland, or simply the thyroid, is an endocrine gland at the front of the neck, below the Adam's apple and before the trachea (windpipe). In humans, it consists of two lobes connected by an isthmus. The thyroid gland secretes thyroid hormones, T3 and T4 and also produces the hormone calcitonin, which controls calcium homeostasis by reducing blood calcium (Ca2+), opposing the effects of parathyroid hormone (PTH).